What a strange, strange book. Fern Britten is a private detective and works alongside a slightly lewd and quite unusual partner, Stewart Brulightly. Most of their work deals with marital problems until the day Brulightly suggests they only accept more exciting cases. When a new client comes to them asking for them to look into the supposedly-suicidal death of her fiance, the pair get in way over their head. I’m still shaking my head at this one. If you know about Brulightly and his unconventional identity, you’ll understand what I mean. He was just such a weird concept! But even beyond the strange partnership, the book threw me for a loop. I’m not good at mysteries. Unless they’re really obvious, I never figure out what’s going on in advance. I couldn’t even begin to guess on this one. It’s so well written, with so many plot twists and turns and secrets uncovered, that it kept me riveted from start to finish. On the other hand, I’m not a huge fan of mysteries, so they tend to slip from my mind after I’ve finished reading them. I remember very little from the book, though that might be attributable to reading at readathon pace. 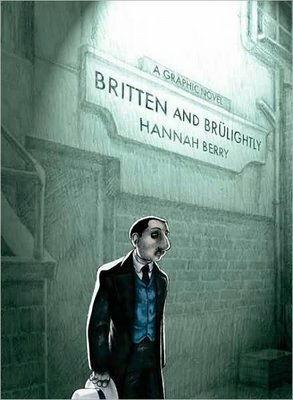 The artwork was gorgeous, and again, Brulightly’s role in the book was just an extra surprise to make the book unique. This is a good book for people who like mysteries, and a fun one for those of us who only dabble in the genre every once in awhile. This entry was posted in 2009, Adult, Visual and tagged readathon, speculative. Bookmark the permalink.